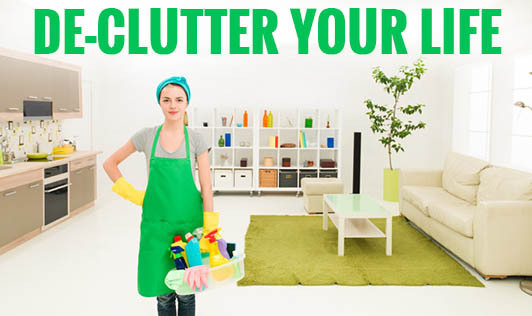 Too much clutter is often a symptom and cause of stress which can affect every aspect of your life. Clutter invites chaos into your life. By devoting a little of your time in getting rid of this clutter, you can reduce stress and will have a more organized and fruitful existence. • Clear off everything that you don't need from your desk. Remember, whatever you have on your desk should hold some value or else toss is out. • De-clutter your computer by getting rid of files and programs that you don't need. These not only slow down your computer but they also create visual clutter. • Clean your room and your closets. Organize everything you've decided to keep into cabinets and drawers, all neatly arranged and out of sight. Donate the clothes that you don't use. • Reconsider your routine. Tackle obligations and chores and develop structure. It's helpful to write down your weekly and daily obligations and plan out what you have to do daily and weekly. • Set aside time each day or week to write down your goals for the day, week, month and the year and include action items on each goal. • Walk, because it stimulates both sides of your brain helping to reduce stress, enhance creativity and improve overall mental clarity. • Disconnect from your phone, shutdown your computer and connect with nature, friends and family. This will help you build a stronger relationship with yourself and your loved ones. It's time to start clearing and growing!